Catholics expecting a Francis “bump” in Sunday Mass attendance for the year following the pope’s visit to Philadelphia in 2015 instead witnessed a slump, according to figures of Mass attendance from last fall. 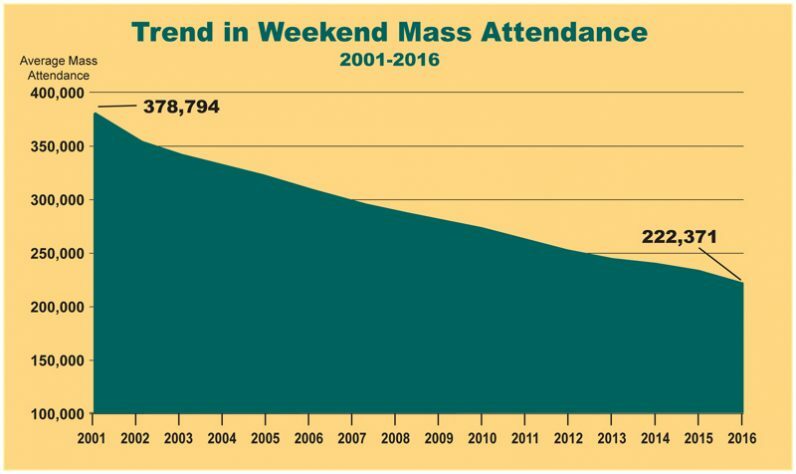 Participation in parish Masses in the Archdiocese of Philadelphia continues to erode, based on actual head counts of successive Saturday evening/Sunday Masses for four weeks in October 2016. Last year’s October Count showed 222,371 Catholics attended weekend Masses during the month in the 217 parishes of the archdiocese. The figure is down from 253,338 since 2012 and from 234,453 in October 2015, just weeks after Pope Francis wrapped up his first visit to the city in two and a half days of festive, prayerful and unforgettable events. Of course, you can’t blame the pope for the many factors likely driving what is a long-term pattern of fewer participants at Catholic liturgies, mirroring lower numbers of participation across many religious communities in the United States. As the data from the archdiocesan Office for Parish Service and Support show, while the number of parishes has declined from 257 to 217 in the period 2012 to 2016, the ethnic diversity of the Catholic population of the archdiocese continues to be reflected in the worship life of the local church. 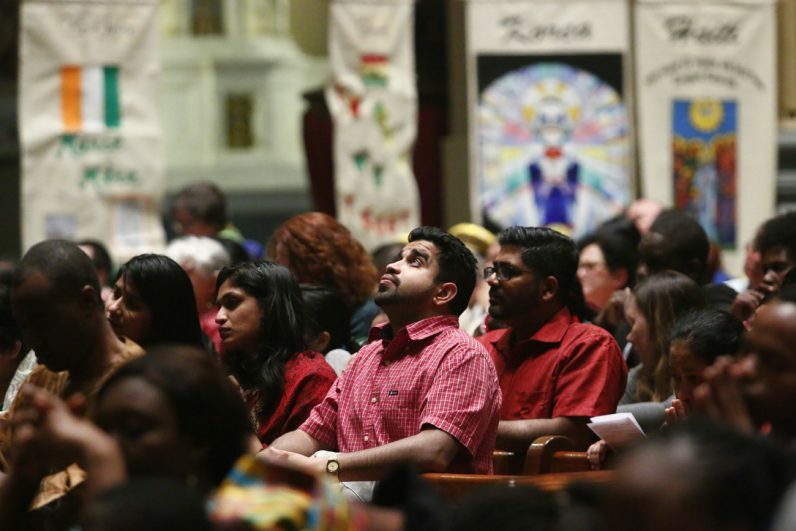 Masses are now celebrated in 19 languages besides English in archdiocesan parishes – see our complete coverage of this sign of growth in the church. Average attendance as a percentage of registered parishioners across the archdiocese also hit an unprecedented low of 20.1 percent, down from 21.8 percent in 2012, which is generally in line with other dioceses in the Northeast U.S.
Also down is the overall Catholic population registered in archdiocesan parishes: 1.10 million in 2016, or 55,000 fewer souls than were registered in 2012. Catholics who attend Mass weekly in the same church may have noticed more gaps in the church pews in recent years than in the past. There are several factors that might be contributing to the decline of registered parishioners attending Mass. Loyalty to parish boundaries has become more fluid as people have become more mobile. Parishioners still on the parish rolls will go to Mass at another church out of convenience of time or location, or preference in the varying style of liturgies, without changing parish registration. They may also be attending monasteries of religious communities that offer Sunday Mass for the surrounding community. For example, many Catholics in the Paoli region of Chester County attend Mass faithfully at Daylesford Abbey, which is one mile from St. Norbert Church, two and a half miles from St. Patrick and three miles from St. Monica. Catholics also attend Mass with college students on campuses such as Villanova University and others in the region. There are some bright sides to the story. The highest numbers of Mass attendance and percentage of parishioners attending remain in the north of the archdiocese, especially Northeast Philadelphia and Bucks County, as they have for several years. By deanery, the Central and Upper Bucks County area (Deanery 10) has surpassed Upper Northeast Philadelphia and Lower Bucks County (Deanery 11) with the highest attendance numbers since 2012. In 2016, Deanery 10 saw 33,684 attending. Deanery 11, at 27,454, has been surpassed by the Western Montgomery County region’s 27,794 (Deanery 5), reflecting the long-term trend of Catholic migration to the northern and western suburbs. 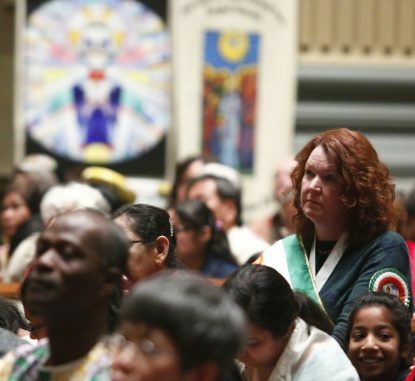 Growth areas aside, most parishes are dealing with the twin phenomena of slipping numbers of English-speaking Catholics at Mass and fewer priests available to celebrate Mass, even as the popularity of liturgies in Spanish and other languages continues to grow. For instance, according to the data 11,672 fewer Catholics participated in Masses in English, and nine fewer Masses were offered in English in 2016; there were 880 Masses offered in English across the archdiocese last year. Meanwhile, even though 27 fewer Spanish-speaking Catholics out of more than 12,000 attended, four more Masses were added at parishes last year, bringing the total to 47 Masses offered in Spanish at 36 parishes – four more parishes doing so than in the previous year. All the attendance data from the 2016 October Count has been included for every parish available on the archdiocese’s website, archphila.org – see the complete parish index here. Select your parish and scroll down to the heading “Report to Pastor.” A linked PDF indicates vital statistics for the parish over the previous five years, while another linked PDF provides data for another prior five years. It might be tempting to make a positive or negative conclusion when viewing a figure considered low or high. But efforts at many parishes are being directed to bring more people to the sacraments, to strengthen parish community life and to nurture Catholics’ relationship with Christ through the church. A restoration of the traditional liturgy brings in the true faithful. I attend a parish in VA run by the Priestly Fraternity of St. Peter. We have 3 standing room only Masses every Sunday and the pews are filled with young families with 5 or more children. This is a stark difference than my home parish in Delco. We Catholics need the sacred to be restored. The world needs it restored. We need clear teaching on doctrine and the Sacraments. The Mass of Paul VI and the overall post-Vatican II culture is insufficient to that end. God love you. Watered-down, touchy-feely ,I’m Ok, you’re Ok liturgies don’t help either. I have been a Catholic all my life of 66 years. The reason attendance is down is 1.) the constant cover-up and corruption of the child molesting in the church. 2.) the attitude of women in the church. Women should be permitted to be priests or deacons .Stop the corruption and allow all genders be equal. Remember the Church belongs to the people not just the clergy.. Interesting. So while Cultural Diversity is surging it seems the only ones left filling the pews are the “Deplorables”. That is the folks Pope Francis seems to lecture to about our rigidity. I wonder what thirty years from now the numbers will show. My parish closing impacted my mass attendance in NYC where I live. I still attend, but less regularly, as I continue to look for a new parish home. It wasn’t the actual closing that was so disheartening, but the process, where we went through this whole drawn out multi-parish planning process where the end was pre-ordained . It felt like the process was created to provide cover for a decision that had already been made and it kind of drained my enthusiam for parish life.